I was pregnant with my second baby and therefore knew I had a window of free time away from work (or as free time as you get with a newborn!) and decided to act on an idea I had been thinking about for a few years - to start my own online children’s store. I knew from my own experience first time round that once you get through the first few shaky months and come out the other end (hopefully unscathed) you soon start a bit of an online shopping obsession (I know I certainly did) whilst they nap and found I was visiting numerous different sites looking for great baby gifting, nursery pieces and anything else I fancied on the way. Picking pieces from each shop which inevitably resulted in a carousel of courier men turning up at the door (much to my husband's dismay!) and so Little Edit was born as a one stop shop for lovely gifting and nursery pieces with some accessories and party wear thrown in too! When it came to picking brands I knew I had a few favourites already, from Lucky Boy Sunday which I had bought previously and absolutely loved their teddys and pillows, which are made from the softest Alpaca wool and came in lovely muted colours which fitted with how I wanted my children’s rooms to look. 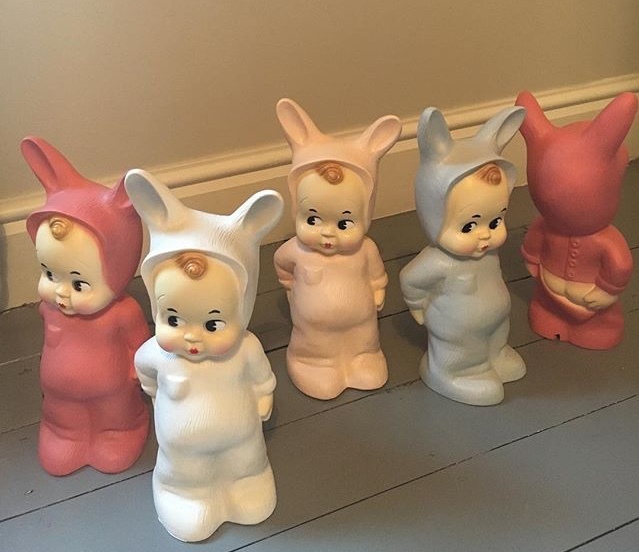 I also loved the kitsch Lapin and Me bunny lamps and had bought a bright yellow one for my first daughter Marlowe's room and had always wanted to stock them as they were fun and a little cheeky but also didn’t feel like the standard childrens cutesy night light. From there we started going to trade shows, where we discovered some new brands who were also starting their journey as a small business at the same time as us such as Modor Neycher who make the softest organic cotton muslins and blankets in soft tones, as soon as we saw their product we knew we wanted to stock them and loved that we could start working together very early on in our businesses and therefore support each other along the way. I also stumbled across a lovely lady called Julie De Gruchy in a gorgeous little gift shop called Cherry Press in Chipping Camden during a little anniversary jaunt away. It had the most amazing letterpress studio in the back (if anyone is looking for beautiful invitations then check them out) and found the most adorable felt unicorn cushions in there which were all adorned with the cutest tutus and snapped one up for Marlowe with the intention of trying to get some for Little Edit. Thankfully my brother's girlfriend is a photographer Radka Dolinska so she kindly helped us out for the day which involved countless furniture moves ( whilst 8 months pregnant!) and a very large giraffe to manoeuvre around the bedroom, we thankfully managed to pull it off and really felt like the whole thing was actually starting to feel very real and that things were all starting to come together, a month later and a new baby girl in the mix and Little Edit was live!